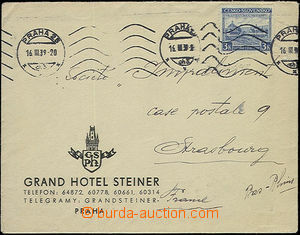 1939 hotel letter sent from Prague 16.III.39 to France with Pof.351, Opening of Congress, really Us, on reverse MC Strasbourg 18.Mars.39; stamp. also envelope in/at právém margin damaged from mechanics machine postmark, overfranked, after all rare usage!! 1939 1939 Postal office invoice on A4 format paid by postage dues 55 pcs (!!) of 20Kč, Pof.55x DL66, DL65, DL63, DL62, DL60, cnl Praha 31/ 4.VIII.39, two pages without writen invoice. Very unusual, no damages. 1940 registered personal delivery letter with paid charge of 2 pieces of delivery stamps after tariff increase, Pof.2x DR1 + 2x 33, 43, mailing postmark Praha 13/7.XI.40, decorative, rare appearance! 1939 express sent response letter with only express charge Pof.2x 31 defraied and with provisional postage due stamps Pof.DL62, 57 as the postage account, mailing postmark train post no. 531 Preerov - Brno 9.XII.39, arrival daily postmark Brno Telegraph and Telephone Central Office / 9.XII.39, decorative, absolutely unique! 1939 express sent response letter with only express charge Pof.2x 31 defraied and with provisional postage due stamps Pof.DL62, 57 as the postage account, mailing postmark Kromeriz 2/ 9.XII.39, arrival daily postmark Brno Telegraph and Telephone Central Office / 9.XII.39, decorative, absolutely unique! 1939-42 letter sent as full printed matter with 20h, Pof.22, uznán only as partial printed matter, burdened by postage-due parallel Czechosl. stamp. 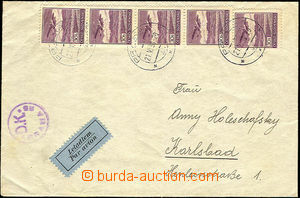 20h Pof.DL57, CDS Prague 25/ 13.XII.39, arrival postmark Brno 2/ 14.XII.39, really rare! 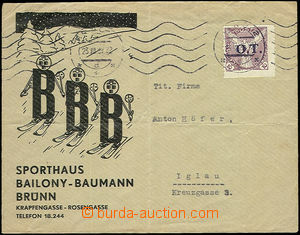 1941 response letter with postage due stamps (even 10K and 5K prices) Pof.Dl13, 12, 3 as the postage account for more consignments (11), mailing daily postmark Plzen 3/ 1.X.42, arrival daily postmark Brno 2/2.X.41, decorative, unique! 1941 response letter with postage due stamps (even 2x 5K price) Pof.Dl 2x 12, 10 as the postage account for more consignments (8), mailing daily postmark Pisek 29.X.41, arrival daily postmark Brno 2/30.X.41, decorative, unique! 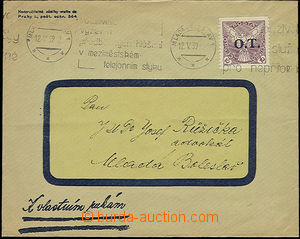 1941 response letter with postage due stamps on the back side (even 2x 10K price) Pof.Dl 2x 13, 11, 9, 8 as the postage account for more consignments, mailing daily postmark Prostejov 5.VIII.41 and a propaganda postmark Viktoria, arrival daily postmark Brno 2/6.IX.41, unique! 1941 response letter with postage due stamps (even 5K price) Pof.Dl12, 11, 9, 5 as the postage account for more consignments, mailing daily postmark Prerov 16.XII.41, arrival daily postmark Brno 2/18.XII.41, decorative, unique! 1942 response letter with postage due stamps (even 10K price) Pof.Dl13, 2x 11 as the postage account for more consignments (10), mailing daily postmark Pisek 22.II.42, arrival daily postmark Brno 2/23.II.42, decorative, unique!